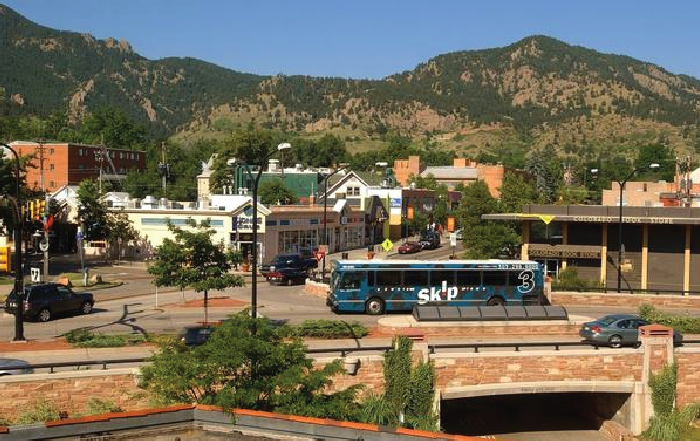 Better Boulder recognizes that transportation infrastructure is but one element of a balanced transportation system. Bike lanes, sidewalks, roads, bus transit, and roads are all important, but none will contribute to a successful, sustainable community by themselves without good land use and urban design to support them. If our community goal is to reduce traffic congestion, air pollution, and carbon emissions, we need more complete and compact urban environments that support the convenient use of automobile alternatives (and not just punitive measures to reduce driving). For example, minimum population densities near transit are needed to support frequent and efficient bus service. Generally 10 homes per acres located near a bus stop will support service running every 30 minutes or so. This might work for commuting but is not so convenient for casual bus use. Higher densities support more frequent and efficient transit and provide a stronger alternative to driving. Mixed-use allows for one trip by any mode to serve a number of daily needs. Located in proximity in a walkable setting, neighborhood schools, local retail services, government services, employment, restaurants, and a mixture of housing types all contribute to a live-work-play urban place. In Boulder, the neighborhoods around North Broadway Shops provide a positive example. With a half-mile walk or bike ride in any direction, neighbors can walk, bike, bus, or drive to a natural grocer, rec center, middle school, medical center, drug store, banks, post office, coffee shops, restaurants, a pub, dental offices, and more. This core area is surrounded by apartments, condos and single-family homes (some with ADUs) and served by high-frequency transit on Broadway and bike lanes on 13th Street. Sidewalks, street trees, pedestrian-activated crosswalks, and bike lanes on 13th Street all make this a prime multi-modal area of Boulder. The walk score of this area is 82, or “Most errands … can be accomplished on foot.” Few would describe this area as overbuilt, overly congested, or too dense and urban.